What Should An Official Nightmare on Elm Street Game Be Like? As cool as it is that Freddy's now playable in DBD, It's not exactly the best representation of what the Nightmare on Elm Street franchise is all about. Freddy doesn't need to chase you down open grounds or inside houses like Jason Voorhees or Michael Myers would, he's already inside your head and your whole psyche's his playground. Unfortunately, that's kind of the problem with making an official Nightmare on Elm Street game. When you've got a setting like the Dream World where everything's possible, it doesn't lend itself easily to an asymmetrical multiplayer game with a defined structure and limited capabilities. So, there's the question for you all: How do you make a game that's a fun, satisfying and accurate Nightmare on Elm Street experience? How do you adapt the concepts, rules, and iconic elements of the films into a multiplayer game's structures and mechanics? Let's put our noggins together and figure this out! So on the discord the japanese player base will be getting their own release! Hopefully this will help boost the PC community. I have finally hit 666! Now on my way to 6,666! So what do you all think is coming? I'd really like it to be items, or a video, or a video about items. Edit - A release date would be cool. @doitagain. What sort of things would get you all excited to play the game again, what fun surprise do you think they have in store for us? Let's have some fun while we wait for Shifty's weekly pep talk. Please keep it civil, thanks and chat soon. Hatchet and Friday the 13th Crossover? As the title suggest if we ever got a crossover between Jason Voorhees and Victor Crowley would you watch the movie? What plot would you think it was set up for them to face-off? If you look at the bottom of the screen of the image you can see he has a change skin option! Whats everyones theory? Adding Vic as a Bot? So how does everyone like the new counselor fox? This implementation won't have any effect on the meta unless if the community want to. What it does? basically a more point of view by tangling the night to be more bright than your average flash light. Dayz is similar to this game, and the item looked good in game. Make it randomly spawn in the maps, and once you find it you can attach it to your counselor. Realistically any camper would bring a chemlight for the woods. Each chemlight will be different colors to add more variety. The chemlight is the threshold to have well lit surrounded areas. +Host disconnect +Lost Connection +The Bonuses idea doesn't really stack on XP that much +Helping a counselor out of Jason grab should give you XP The XP been a problem since launch, and I don't get adequate XP even when I play good. It's a chore to level might as well play a MMO since leveling is a chore. + Not everyone wants to play this game to death just to get the new Jason. Nerf the longer XP for higher levels. There was a Tommy who almost clutch ,but messed up since the shot stunned Jason in the barn near a corner wood fence with no intractable windows Jason body can block a entry even if stunned which is bullocks. I want Jason to be move-able when running against his body an animation should be the arm push to Jason when stunned. This animation is only exclusive when a Jason is stunned. Part 8 Jason feels more stronger and little faster, or is it just me? PSN Spring Break DLC not available for purchase? The update installed, but the DLC isn't showing in the list to purchase. Since the Emotes implementation How to look at scoreboard ingame? If it's removed i'm fine, but I really liked seeing who is dead as Jason, and counselors. It makes even harder for Jason to see if someone is trying to kill him at his shack and not disregard the call from his mother just because all the females are dead in the game, and only males furthermore it was a hoax to waste Jason time . Party Chat isn't working as usually when I go inside my own. I can hear players even though i'm inside my party please fix this XD. I don't want to hear annoyances that players barf on the mic. Battlefield 4 is the other game that have the same bug lol, but the player can't hear you when you have a microphone conveniently on your headphones it's the same in this game. 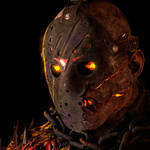 Just sharing my opinion here on the two new councilors, a lot of people will disagree with me, but I think Paul Holt and mark from Friday the 13th part 2 should be added, here's just an idea Paul holt could have a new stat entirely, and he could be a good counter when going up against Jason, and I remember mark being quite smart in the movie and athletic, just an example you could remove the wheelchair and make mark able to walk, run etc. He could be like buggzy only with way better repair and stealth. Either way please add mark, by far one of the most memorable characters from the movies.